Johannes "Macky" Steinhoff (15 September 1913 – 21 February 1994) was a Luftwaffe fighter ace during World War II, German general, and NATO official. He was one of very few Luftwaffe pilots who survived to fly operationally through the whole of the war period 1939–45. He was also one of the highest-scoring pilots with 176 victories, and one of the first to fly the Messerschmitt Me 262 jet fighter in combat as a member of the Jagdverband 44 squadron led by Adolf Galland. Steinhoff was decorated with the Knight's Cross of the Iron Cross with Oak Leaves and Swords, and later received the Grand Cross of the Order of Merit of the Federal Republic of Germany and several foreign awards including the American Legion of Merit and the French Legion of Honour. He played a role in the so-called Fighter Pilots Conspiracy when several senior air force officers confronted Hermann Göring late in the war. Steinhoff joined the West German government's Rearmament Office as a consultant on military aviation in 1952 and became one of the principal officials tasked with building the German Air Force during the Cold War. 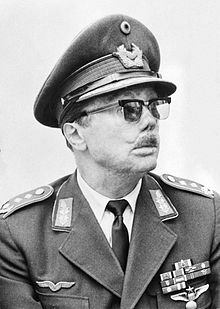 He became the German Military Representative to the NATO Military Committee in 1960, served as Acting Commander Allied Air Forces Central Europe in NATO 1965–1966, as Inspector of the Air Force 1966–1970 and as Chairman of the NATO Military Committee 1971–1974. In retirement, Steinhoff became a widely read author of books on German military aviation during the Second World War and the experiences of the German people at that time. He was the father-in-law of the American Republican politician Michael Bird. Johannes Steinhoff was born on 15 September 1913 in Bottendorf, Thuringia, the son of an agricultural mill-worker and his traditional housewife. He had two brothers, Bernd and Wolf, and two sisters, Greta and Charlotte. His sister Charlotte was married to Ludwig Hahn. Hahn was the chief of the Sicherheitspolizei and Sicherheitsdienst in occupied Warsaw and participated in the destruction and evacuation of the Warsaw Ghetto. Steinhoff graduated from the Klosterschule Roßleben convent school after having "studied the classics and languages such as French, English, Latin and Greek," and from 1932–1934 he read philology at the University of Jena, where he was a member of the Landsmannschaft Suevia academic fencing society and male fraternity. Forced to abandon his university studies for lack of funds, Steinhoff enlisted in the Kriegsmarine, where he served for one year alongside his friend Dietrich Hrabak as a naval flying cadet before transferring to the newly reformed Luftwaffe in 1936. There, after completing his training as a fighter pilot, Steinhoff was posted to Jagdgeschwader 26. Steinhoff married his wife Ursula on 29 April 1939, and they had one daughter, Ursula Steinhoff Bird, who became the wife of (now-retired) Colorado State Senator Michael Bird and a son named Wolf. Steinhoff's first combat experience was in 1939 when he fought RAF Vickers Wellington bombers that were attacking coastal industry in the Wilhelmshaven region. In February 1940, he was transferred to 4./JG 52 where he served during the Battle of France and the Battle of Britain. In June 1941 JG 52 was on the Eastern Front for offensive operations against the Soviet Union, becoming one of the highest scoring units in the Luftwaffe. Steinhoff claimed 28 Soviet aircraft shot down in the first month and by August, Steinhoff had attained 35 victories and been awarded the Knight's Cross of the Iron Cross. In February 1942, as a Hauptmann, he was appointed to command II./JG 52 and claimed his 100th victory on 31 August. He was the 18th Luftwaffe pilot to achieve the century mark. Steinhoff remained with JG 52 until March 1943, when he took over Jagdgeschwader 77 as Geschwaderkommodore operating over the Mediterranean. On 28 July 1944, Steinhoff received the Knight's Cross of the Iron Cross with Oak Leaves and Swords (Ritterkreuz des Eisernen Kreuzes mit Goldenem Eichenlaub und Schwertern). He ended the war as a jet pilot, first being posted to Kommando Nowotny in October 1944 and then, with the rank of Oberst, as Geschwaderkommodore of Jagdgeschwader 7 in December. JG 7 was equipped with the Me 262 jet fighter and Steinhoff was allowed to hand-pick several Staffelkapitäne, including Heinz Bär and Gerhard Barkhorn. After the heavy losses suffered during Operation Bodenplatte (Unternehmen Bodenplatte), Steinhoff and other fighter leaders fell into disfavour following the so-called 'Fighter Pilots Revolt' against what was perceived as the incompetence of Luftwaffe high command and Hermann Göring in particular. Along with several others, Steinhoff was relieved of his command for challenging Göring's leadership. After a brief period spent in internal exile, Steinhoff transferred to the Jet Experten unit Jagdverband 44 being formed by his close friend and confidant Adolf Galland in early 1945. Steinhoff initially acted as a de facto recruiting officer, persuading a number of veteran Luftwaffe aces to join the unit, some coming out of the Fighter Pilots' Rest Home at Bad Wiessee to do so. Steinhoff scored six confirmed kills with the unit. [Note 1] Steinhoff survived nearly 1,000 combat missions, only to see his flying career come to an end on the ground. On 18 April 1945, Steinhoff's Me 262 suffered a tyre blow-out and crashed on take-off from München-Riem airfield. Steinhoff suffered severe burns (spending two years in hospital) which left him visibly scarred despite years of reconstructive surgery. His eyelids were rebuilt by a British surgeon after the war. His wartime record was 176 aircraft claimed destroyed, of which 152 were on the Eastern Front, 12 on the Western Front and 12 in the Mediterranean. He also flew 993 operational sorties. Steinhoff was shot down 12 times but had to bail out only once. Explaining his preference to remain with his damaged aircraft, Steinhoff admitted: "I only bailed out once. I never trusted the parachutes. I always landed my damaged planes, hoping not to get bounced on the way down when I lost power." Steinhoff recognised the situation of postwar Germany, and was invited by West Germany's new interim government to rebuild the Luftwaffe within NATO, eventually rising to the rank of full general. Steinhoff served as Chief of Staff and acting Commander Allied Air Forces Central Europe (1965–1966), Inspector of the Air Force (1966–1970) and later as Chairman of the NATO Military Committee (1971–1974). After retiring from his NATO command in 1974, Steinhoff became a widely read author of books on German military aviation during the war and the experiences of the German people at that time. He wrote The Final Hours, which detailed a late-war plot against Hermann Göring, and also published a vivid account of his time in Italy: Messerschmitts over Sicily: Diary of a Luftwaffe Fighter Commander. Steinhoff also became a watercolorist, and chairman of Germany's Dornier Aviation. Steinhoff received numerous honours for his work on the structure of the post war German Air Force and the integration of the German Federal Armed Forces into NATO, including: The Order of Merit with Star, the American Legion of Merit and the French Légion d'honneur. 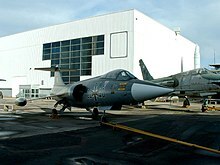 One of Steinhoff's contributions was dealing with the high accident rate the air force was having with its F-104 Starfighters. Upon researching the issue, Steinhoff, who had always been a good teacher, deduced that the problem was not the aircraft but poor training for pilots on that particular aircraft. He addressed the problem with an intensive training regime and the accident rate dropped dramatically. Steinhoff played a major part in the controversial Ronald Reagan US Presidential visit to Kolmeshöhe Cemetery near Bitburg, in 1985. Planned as an act of reconciliation in light of the 40th anniversary of V-E Day that week by Reagan and then West German Chancellor Helmut Kohl, it was discovered that 22 Waffen-SS graves were among the 2,000 military interments. After severe national and political pressure to cancel the visit from Jewish groups and World War II American veterans on Reagan, the visit was preceded by Reagan and Kohl visiting the Bergen-Belsen concentration camp. Along with Kohl, there was 90-year-old General Matthew Ridgway, who had commanded the 82nd Airborne in World War II, and Steinhoff; Reagan placed a wreath at a wall of remembrance in the cemetery. After placing the wreath, they all stood to attention in honour while a short trumpet salute was played. At the end, Steinhoff suddenly turned and in an unscripted act shook hands firmly with a pleased Ridgway in an act of genuine reconciliation. A very surprised Kohl later thanked Steinhoff for his actions who later said that it just seemed to be the right thing to do. On February 21, 1994, Steinhoff died in a Bonn hospital from complications arising from a heart attack he suffered the previous December. He was 80, and had lived in nearby Bad Godesberg. Matthews and Foreman, authors of Luftwaffe Aces — Biographies and Victory Claims, researched the German Federal Archives and found records for 168 aerial victory claims, plus nine further unconfirmed claims. This figure of confirmed claims includes 149 aerial victories on the Eastern Front and 19 on the Western Front, including three four-engined bombers and six victories with the Me 262 jet fighter. Victory claims were logged to a map-reference (PQ = Planquadrat), for example "PQ 95371". The Luftwaffe grid map (Jägermeldenetz) covered all of Europe, western Russia and North Africa and was composed of rectangles measuring 15 minutes of latitude by 30 minutes of longitude, an area of about 360 square miles (930 km2). These sectors were then subdivided into 36 smaller units to give a location area 3 × 4 km in size. This and the ♠ (Ace of spades) indicates those aerial victories which made Steinhoff an "ace-in-a-day", a term which designates a fighter pilot who has shot down five or more airplanes in a single day. This and the – (dash) indicates unwitnessed aerial victory claims for which Steinhoff did not receive credit. In 1990, the former Royal Air Force Gatow in Berlin Gatow, was named General Steinhoff Kaserne on being taken over by the German Federal Armed Forces. And on September 18, 1997, the Jagdgeschwader 73 (fighter wing 73) of the German Air Force was named "Steinhoff" in honor of the general. Steinhoff is one of only a handful of pilots honored in this way, along with Manfred von Richthofen and Max Immelmann. ^ a b c d According to Matthews and Foreman this claim is unconfirmed. ^ According to Matthews and Foreman claimed at 06:15. ^ According to Matthews and Foreman claimed at 14:55. ^ According to Matthews and Foreman claimed at 13:30. ^ According to Matthews and Foreman claimed at 19:55. ^ According to Matthews and Foreman claimed at 07:46. ^ According to Matthews and Foreman claimed at 10:27. ^ This claim is not listed by Matthews and Foreman. ^ a b c d Saxon 1994. ^ Der Spiegel Volume 1/1973. ^ a b c Heaton 2000. ^ Toliver & Constable 1996, p. 85. ^ Petrick 2010, p. 151. ^ a b Matthews & Foreman 2015, pp. 1257–1260. ^ a b c d e f g h Matthews & Foreman 2015, p. 1257. ^ a b Prien et al. 2001, p. 226. ^ a b Prien et al. 2000, p. 140. ^ a b Prien et al. 2002, p. 155. ^ a b Prien et al. 2002, p. 156. ^ a b c d e f g h i j Prien et al. 2003, p. 41. ^ a b c d e f Prien et al. 2003, p. 44. ^ Matthews & Foreman 2015, pp. 1257, 1259. ^ a b c d e Prien et al. 2003, p. 45. ^ a b c d e f g h i j Prien et al. 2003, p. 46. ^ a b c d Prien et al. 2003, p. 42. ^ a b c d e f Prien et al. 2003, p. 43. ^ a b Prien et al. 2003, p. 47. ^ a b Matthews & Foreman 2015, pp. 1257–1259. ^ a b c d e f g h i Prien et al. 2006, p. 481. ^ a b c d e f g h Prien et al. 2006, p. 490. ^ a b c Prien et al. 2006, p. 491. ^ a b c d Prien et al. 2006, p. 482. ^ a b Prien et al. 2006, p. 494. ^ a b c d e f g h Prien et al. 2006, p. 495. ^ a b Prien et al. 2006, p. 483. ^ a b Matthews & Foreman 2015, p. 1259. ^ a b Prien et al. 2006, p. 484. ^ a b c d e Prien et al. 2006, p. 485. ^ a b c d e f g Prien et al. 2006, p. 496. ^ a b c d Prien et al. 2006, p. 486. ^ a b c d e f g h Prien et al. 2006, p. 487. ^ a b c d e f g Prien et al. 2006, p. 497. ^ a b c d e f g h i j k l m Prien et al. 2006, p. 498. ^ a b c d e f Prien et al. 2006, p. 488. ^ a b c d e f g h Prien et al. 2006, p. 489. ^ a b c Prien et al. 2006, p. 499. ^ Prien et al. 2012, p. 378. ^ a b c d Prien et al. 2012, p. 379. ^ a b c Matthews & Foreman 2015, pp. 1259–1260. ^ a b c d e f g h i Prien et al. 2011, p. 302. ^ Prien 1995, p. 2433. ^ a b Prien 1995, p. 2434. ^ Prien 1995, p. 2435. ^ a b c Matthews & Foreman 2015, p. 1260. ^ Obermaier 1989, p. 37. ^ a b c Scherzer 2007, p. 721. ^ Fellgiebel 2000, p. 410. Bergström, Christer. "Bergström Black Cross/Red Star website". Identifying a Luftwaffe Planquadrat. Retrieved 17 February 2018. Heaton, Colin D. (February 2000). "Interview: Luftwaffe Eagle Johannes Steinhoff". Military History Magazine. Retrieved 13 July 2013. Petrick, Jörn (2010). Gedenkbuch der Landsmannschaft im Coburger Convent Saxo-Suevia zu Erlangen. Zur Erinnerung an unsere verstorbenen Bundesbrüder (1878-2010). Erlangen. Prien, Jochen (1995). Geschichte des Jagdgeschwaders 77—Teil 4—1944–1945 [History of Jagdgeschwader 77—Volume 4—1944–1945] (in German). Eutin, Germany: Struve-Druck. ISBN 978-3-923457-29-8. Prien, Jochen; Stemmer, Gerhard; Rodeike, Peter; Bock, Winfried (2000). Die Jagdfliegerverbände der deutschen Luftwaffe 1934 bis 1945 Teil 3—Einsatz in Dänemark und Norwegen 9.4. bis 30.11.1940—Der Feldzug im Westen 10.5. bis 25.6.1940 [Fighter Pilot Association of the German Luftwaffe 1934 to 1945 Part 3—Assignments in Denmark and Norway 9 April to 30 November 1940—The campaign in the West 10 May to 25 June 1940] (in German). Struve-Druck. ISBN 978-3-923457-61-8. Prien, Jochen; Stemmer, Gerhard; Rodeike, Peter; Bock, Winfried (2011). Die Jagdfliegerverbände der Deutschen Luftwaffe 1934 bis 1945—Teil 11/II—Einsatz im Mittelmeerraum—1.1 bis 31.12.1943 [The Fighter Units of the German Air Force 1934 to 1945—Part 11/II—Action in the Mediterranean Theater—1 January to 31 December 1943] (in German). Eutin, Germany: Struve-Druck. ISBN 978-3-942943-00-0. Saxon, Wolfgang (23 February 1994). "Gen. Johannes Steinhoff, 80, Dies; Helped Rebuild German Air Force". New York Times. Retrieved 13 July 2013. Steinhoff, Johannes (2005). In letzter Stunde. Verschwörung der Jagdflieger Vom Widerstand der Jagdflieger gegen Reichsmarschall Göring (in German). Flechsig. ISBN 3-88189-592-2. Originally published in German in 1974, and then in English in 1977 as The Last Chance - The Pilots' Plot Against Goering. ISBN 0-09-129620-X. Steinhoff, Johannes (2005). Die Straße von Messina. Tagebuch des Kommodore (in German). Flechsig. ISBN 3-88189-593-0. Schneekluth Munich(with Peter Pechel, Dennis Showalter, foreword by Helmut Schmidt) (4. Edition 1989). Deutsche im Zweiten Weltkrieg. Zeitzeugen sprechen. ISBN 3-7951-1092-0. Toliver, Raymond F.; Constable, Trevor J. (1996). Fighter Aces of the Luftwaffe. Schiffer Publishing. ISBN 978-0887409097. "Bis zum letzten". Der Spiegel (in German). 1. 1973. Retrieved 29 January 2015.